Bank of Africa(BOA) Kenya has dropped the interest rate charged on its education credit facility,' Soma Loan' by a 0.5 percent margin in an effort to promote going back to school culture in kenya. 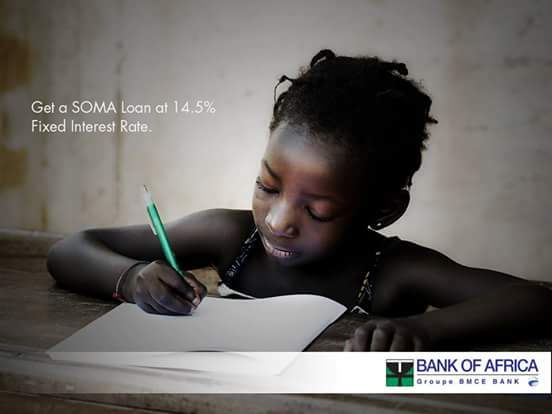 The loan facility which used to attract a 15% interest rate was lowered to 14.5%, first to make BOA to be in line with the new banking law of interest rates capping and secondly to encourage parents and guardians to send their children to school easily after acquiring the affordable school fees loan. Its a loan designed to help in smooth school fees payment. The facility is available to patents,guardians and students (especially those in college or university).